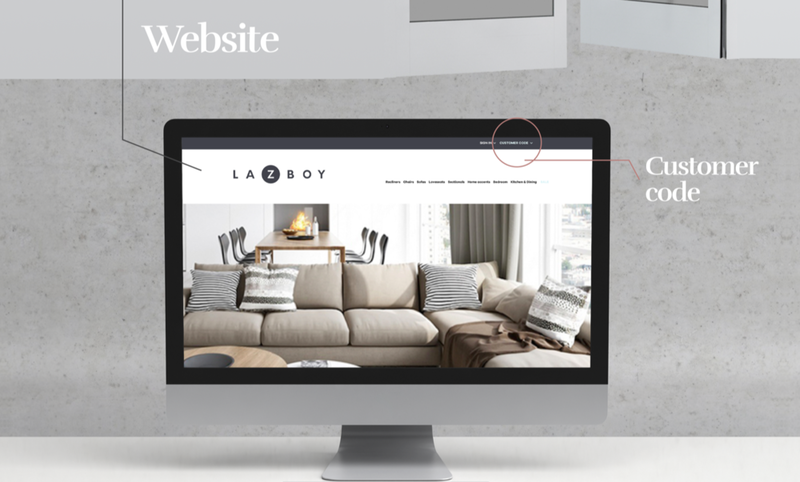 Reimagine the retail experience of La-Z-Boy and create a campaign to drive traffic to stores. La-Z-Boy has traditionally been known for big, comfy recliners. Several years ago, the brand tried to showcase its offerings beyond recliners by creating sub-brands that sell everything from sectionals to desks to nightstands to dining tables. La-Z-Boy shifted its strategy to emphasize style first, which goes against the comfort it is known for. By creating sub-brands and emphasizing style first, La-Z-Boy is doing too much and has lost the brand identity that it is famous for. We do so much more on our couches than just sit -- our living rooms are also a place to nap, snack, watch movies, and recover when we're sick. Expand La-Z-Boy from reclining to relaxing. Make your living room into a haven of relaxation. While researching, we came to our insight that we do so much more on our couches than just sit. We talked to people about their impression of La-Z-Boy vs. other furniture brands, asked La-Z-Boy owners why they loved their comfy furniture, visited two La-Z-Boy store locations, pulled data from Simmons, read comments on Reddit, and more. On average, people spend four hours each day sitting on their sofas. When decorating, we talk first about a style we want to mimic, or what colors, designs, and trends we like. People talk about La-Z-Boys the same way they talk about mattresses. We heard people use terms like "pillow top" and "lumbar support" when talking about La-Z-Boy, emphasizing the idea that comfort is king for this brand. Lounging is viewed in a negative light, but it shouldn't be. e often feel bad for relaxing, when in reality, taking breaks can make us happier, more focused, and more productive. OPPORTUNITY: Expand La-Z-Boy from reclining to relaxing. People know La-Z-Boys are comfy, so the brand is successful at reaching those who put comfort above all else. With the opportunity to expand from reclining to relaxing comes the opportunity to expand our target into people who don't yet realize the comfort they're craving. STRATEGY: MAKE YOUR LIVING ROOM INTO A HAVEN OF RELAXATION. Our team adjusted La-Z-Boy's logo to emphasize relaxation and kicking back. We focused on rounded typography and changed the angled oval to a circle. Our color palette contains soft blues, dark gray rather than black, and a salmon color that pops without being too bright. We split the creative campaign into six touch points to reach our target through the entire consumer journey. Below are the six touch points. We created messaging to catch horizontal people on horizontal screens -- specifically, YouTube pre-roll -- to remind them that La-Z-Boy is all about kicking back and taking a break from the vertical world. Walking into a La-Z-Boy should be the sensory equivalent of a spontaneous shoulder massage. Instead of overwhelming customers with an abundance of furniture, we created the Cozy Cafe, a place for customers to relax, grab a coffee, and get cozy with blankets and pillows. Customers will be given a remote upon arrival, which they can use to scan and save products they like, or call a consultant for help. The remote allows customers to meander through the store and shop at their own pace, making the entire retail experience more calm and pleasant. Clutter is subconsciously uncomfortable. It divides our attention, making it hard to focus or relax. The retail space is in desperate need of breathing room. 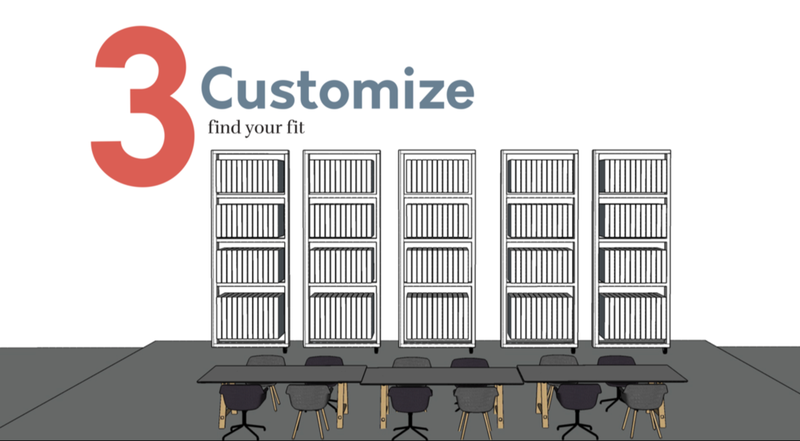 We decreased product density on the sales floor and reorganized the flow into three clear zones: one for recliners, one for sets, and one for couches -- with plenty of space to wander. La-Z-Boy’s current design center has a “me-too” design aesthetic, parroting competitors’ Better Homes and Gardens vibe. Instead of trying to imitate, La-Z-Boy can own a more unique design principle that prioritizes the simple creature comforts of “hygge” (pronounced hue-guh). “Hygge” is a Danish ritual of enjoying life’s simple pleasures, and focuses on being cozy and content. This feeling will be exhibited by the new design center and by renaming designers as “Comfort Consultants,” complete with a new, more casual and comfortable dress code. The La-Z-Boy experience doesn’t end at the door, since shopping for furniture requires time and consideration. 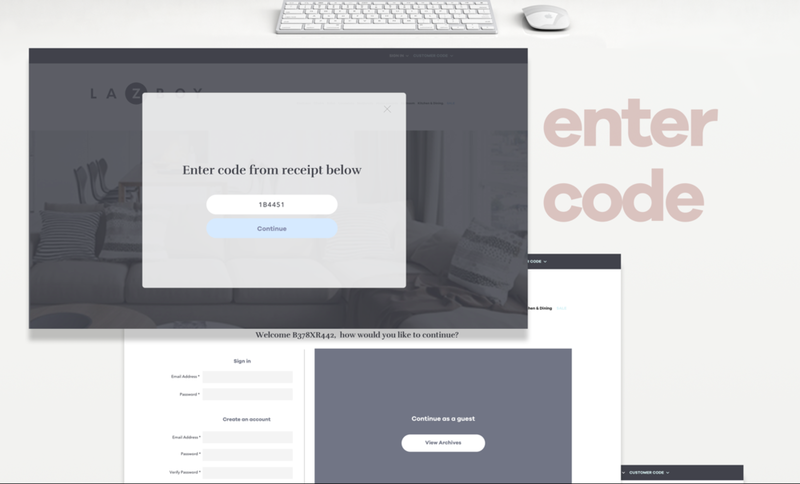 To make that process as comfortable and helpful as possible for our customers, we created a post-retail platform to enable prolonged engagement with our product line. When a customer returns the remote, a receipt is printed with a unique customer I.D. 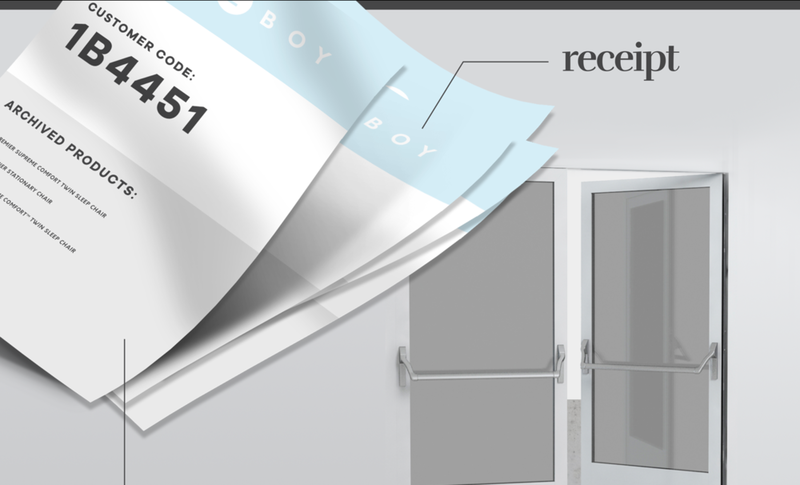 number, which he can enter on the La-Z-Boy website to access his personal furniture selection, allowing him to look back later at items he saw and liked in store.